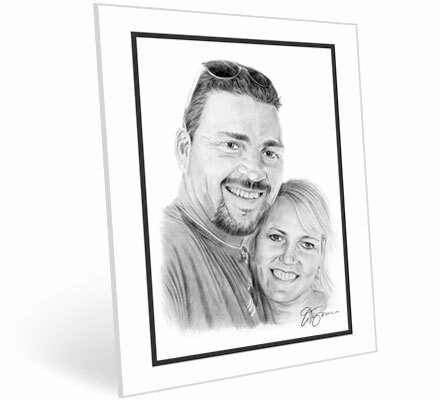 Allow me to create your own unique and personalised pencil portrait of your beloved pets, dogs, cats, horses, other animals, children, family members or friends or anything else that you want drawing. All pencil drawings are 100% hand-drawn from your supplied photographs and I offer many different sizes and prices to meet your needs. All come with a double mount (matte) except the largest size of A3. For all my portraits I use 188g watercolour paper and Faber-Castell black watercolour pencils, which are strong, dark and do not fade. Portraits available in 5 different sizes, starting from 7" x 5" upto 16.5" x 11.75"
All orders include a free print of the commissioned portrait. Portrait size - 7" x 5"
Mount (Matte) size - 9" x 7"
Portrait size - 8" x 6"
Mount (Matte) size - 10" x 8"
Portrait size - 10" x 8"
Mount (Matte) size - 12" x 10"
Mount (Matte) size - 14" x 11"
STEP 1 - Send me details and photos. When you are ready to order, send me details of what you would like doing and the size of the drawing. I will also need your photos. You may already have a photograph that is suitable, or you could try taking some new ones. Email them to me at garytymon@aol.com. Before I can begin on the drawing I would need the full payment for smaller size portraits or a 50% deposit for larger A3 sizes. You can send the payment to me using either paypal, credit card or bank transfer (I will supply a payment invoice to you if paying via credit card or paypal or send my bank details if paying via bank transfer). When I have the photos and payment I will then make a start on your pencil portrait which usually takes 1-3 days for completion (depends on size). When I have finished i can send you a jpg of the portrait to check and you can let me know what you think or if any changes are needed. If you live in the UK, postage is free. Orders are sent flat-packed via recorded delivery using first class Royal Mail and usually take 1-2 days to arrive. If you live outside the UK, shipping rates are shown in the price list table (depends on size of portrait) and orders are sent via first class recorded airmail and can take 10-20 days for delivery. What kind of photos are suitable? I need a photo that is in good lighting, sharp and fairly close up so that I can see enough detail. The sharper the image and the larger the image, the better the portrait will turn out. Photos that are taken on digital cameras with a medium/high resolution would be ideal, photos taken on a camera phone most of the time are pixelated so may not be suitable. If in any doubt or have any questions and need to contact me please email me at garytymon@aol.com. Can you combine 2 or more photos into 1 portrait? Yes i can combine seperate photos together to make the portrait, however, if you want the drawing to look like the subjects are together the photos need to be of similar lighting and similar quality for me to use them. It doesn't matter so much if you want a montage of images fading into each other. Can you alter things in the photo? I can add or remove things from the photo within reason. For example, if you wanted me to remove a collar on your dog's photo that's fine. Generally I can't change the positioning or angles in a single photo but if you have a number of images taken at the same time and in the same lighting I may be able to compose the subject differently. Can I purchase prints of the finished portrait? Yes, a free print of the finished portrait is included in the order but additional prints can also be purchased from me for a small fee of £5 each print. Do you sell prints of the commission in your prints for sale section? Sometimes i will consider selling prints of the commission depending on the subject. If that is the case, I will ask your permission beforehand to sell as a print. Do you offer larger sizes than 16.5" x 11.75"? No, at the moment A3 (16.5" x 11.75") is the largest size i can offer as commissions. Unfortunately I dont offer framing due to probability of breakages in transit so i will leave the framing upto you. I live locally, can I collect from you? Yes, if you live around Doncaster and wish to drop off payment or collect the portrait, thats fine. Phone me or send me an email to arrange a time. A selection of recent commissions - click for a larger view.